We’d love your help. 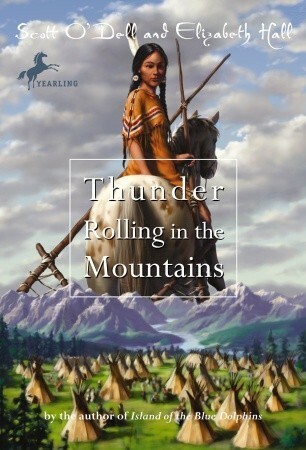 Let us know what’s wrong with this preview of Thunder Rolling in the Mountains by Scott O'Dell. It is spring of 1877 when fourteen-year-old Sound of Running Feet, daughter of Chief Joseph of the Nez Perce, sees white people panning gold in the little creek that feeds the Wallowa River, and brings word of them to her father. "They are the first, but more are on the way," he says. "We are few and they are many. They will devour us." It is Sound of Running Feet who narrat It is spring of 1877 when fourteen-year-old Sound of Running Feet, daughter of Chief Joseph of the Nez Perce, sees white people panning gold in the little creek that feeds the Wallowa River, and brings word of them to her father. To ask other readers questions about Thunder Rolling in the Mountains, please sign up. y idd swain neklice lik to haved war wid others of the setters? One thing I really liked about this book was how vicious the main character was. Even when she had her character growth and learned, that didn't completely go away. It was refreshing to see that the moral wasn't forgive everything and give everyone the benefit of the doubt, like so many books aimed at this age group. It also really hurt, because I wanted them to win so much, even though I knew they wouldn't. If your into the wild west stories of the past, then you may be interested in this book. With a story line of an Indian tribe moving out because of the white soldiers pushing them out brings action and suspense to who the reader of this book is. This was set in the land where I grew up, so I knew the story of Chief Joseph and his people. This touching account is one that should be read and remembered. Historical fiction is always fascinating, you are learning while enjoying a great story! With the content, young readers beware. I recommend this book for everyone ages 13+. Fifteen-year-old Sound of Running Feet survives incredible hardship--including betrayal by both white men and other tribes in this fictionalized novella. Odell's detailed account of the brutal removal of the Nez Perce from Wallowa, Idaho to Oklahoma proves interesting reading both for students of Native American heritage as well as teenage girls in general. The reader's understanding of this cruel odyssey is enhanced by the excellent map of this heart-rending Route of the Nez Perce from June-October of 1877, which precedes the actual narrative. Elziabeth Hall's Foreword explains her collaboration with the ailing author, while her grim Afterword summarizes the fate of the female protagonist and that of her separated people. The title may be somewhat misleading, for it is not indicative of the anger of the Native Americans, or even the presumed pain of their gods; rather, it is qutie simply the translation of Chief Joseph's name. This aged warrior proves both solemn and wise--possessing innate personal dignity to the end, for the good of his people was his chief concern. His heart was understandably broken by the sad departure from his beloved Mother Country and the death of many of his chiefs, plus the wanton betrayal of trusting fellow Indian tribes. Yankees--but at what shameful cost to human dignity! A blunt, straightforward telling of the story of Chief Joseph and the Ne-mee-po's (also known as Nez Perce) experience as seen by his daughter, Sound of Running Feet. The story tells of her experience as the Ne-mee-po were kicked off their land by the Blue Coats (US soldiers) and what ensues as they work toward safety. Seeking safety they embark on a journey to freedom, but in the end are forced to surrender in the Battle of Bear Paw in Montana. Based on historical events and incorporating Chief A blunt, straightforward telling of the story of Chief Joseph and the Ne-mee-po's (also known as Nez Perce) experience as seen by his daughter, Sound of Running Feet. The story tells of her experience as the Ne-mee-po were kicked off their land by the Blue Coats (US soldiers) and what ensues as they work toward safety. Seeking safety they embark on a journey to freedom, but in the end are forced to surrender in the Battle of Bear Paw in Montana. Based on historical events and incorporating Chief Joseph's words, the book doesn't hold much back and shares the events of their life frankly. Recommends it for: STUPID PEOPLE!. WOW! Good book. Apparently it was finished by Scott oDells wife, Elizabeth Hall, but the voice remains the same. The book may be short, as most of his books, but it is astounding, just the same. WOW! Good book. Apparently it was finished by Scott o´Dell´s wife, Elizabeth Hall, but the voice remains the same. The book may be short, as most of his books, but it is astounding, just the same. In 1877 American Soldiers are sent to force the Nez Perce onto a reservation. Chief Joseph fled toward Canada all the way being attacked. They able to win all of them but the last one. Book if filled with heartache and triumph. Good book for young readers a little slow but still interesting for older readers. I also find to be interesting this book would have not been finished if not for his Wife, Elizabeth Hall, stepping in and completing it after his his death in 1989. This was the book that Scott O'Dell's didn't finish because he was writing it until about 2 days before he died at the age of 91 or something like that. I didn't like it as much as some of his others. Although I guess it is in keeping with his simplistic, straight-forward, hide-nothing-from-the-young-readers style. It was an interesting story, but there were some events that didn't really make sense to me at the end. I think this book is very descriptive. It teaches us a lot of things in the native americans time, but in a very fun, not boring way. It is about the Nez Perce having to move to another camp place because the Americans were trying to drive them out. Some wanted to fight and so they fought in the war. Not as good as his others in my opinion, mostly because he co-wrote it with another author. He died before this book was published, and Elizabeth whatever-her-name-is took over for him; you can tell where this happened, as the book gets much more violent and depressing. I was disappointed because I love everything else he's written. 1877, Wallowa Valley, Oregon / West. Follows The Sound of Running Feet, the daughter of Chief Joseph as her people the Ne-mee-po (Nez Perce) as they are forced from their homeland and fight against being forced onto a reservation. Includes a lot of historical detail about daily life and the hardships they were forced to endure. I did not realize that this was a true story. I love these stories about the indians. I always learn so very much. This is a sad story but then most of the indian stories are. Quick and easy read. Great for all ages. Not O'Dell's best work, but an interesting, fictionalized account of a very sad, shameful story from our nation's history. I read this aloud as a supplement while teaching my children about this era in American history. I read this in the 4th grade. I don't remember it at all, perhaps I'll pick it up again sometime and see what I think - and whether I would recommend it to children interested in Native American stories. A gripping read, but very dark. Even gruesome at times. I read it with my 5th grader and was surprised at the level of graphic violence. True to the times though, and very enlightening at the same time. I absolutely hated this book, It is predictable, to much war, and has a cheesy romance. I loved The Island Of The Blue Dolphins, and Zia. This book, did not work for me though. I do not recommend this book. This was an awesome book, but one that was also sad but true. I am glad there are books and stories out there that remind us what a difficult time the Native Americans had when they were forced to sacrifice everything.